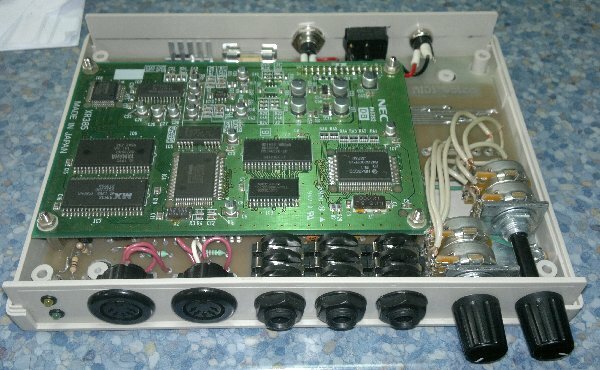 I did see raoulblues has posted this in English in the midibox forum. If I find it again, I'll post the link. Fortunately, it's fairly readable as-is in French. hehehe.....sounds like you and I have both tried to 'correct' organ sounds! I'm reading this forum for about 4 months and it inspired me to build my own GM Voice project. Thank you guys, all of you. After a long period of designing, and waiting for the board, and waiting for the DB60XG clone, and the MAX743, and a USB/MIDI cable (long live eBay and Chinese sellers), it took me only 3 days to assemble the whole thing. All other parts I bought in local stores, including the casing. I wanted it to be as much portable as possible, so I chose the slimmest possible casing that could fit the project, and voila! 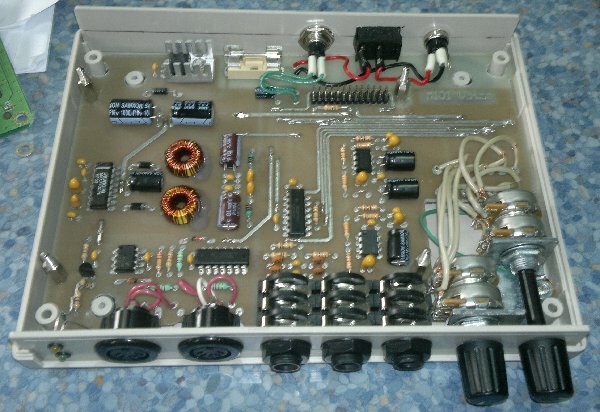 The PSU uses 7805 for the +5v rail (no surprise) and MAX743 as a dual output commuting power supply for +/-12v rails. And the whole thing is powered from an external and widely available 7.5v power adapter. I'm very pleased with this approach because it uses a single voltage supply and the 7805 does not get too hot. I also used a 1N4008 in series to protect against polarity inversion! And it works so damn good! And because my M-Audio KeyStudio 49i has a headphone output, I designed the same for this project. For this I took the idea from here. I only didn't mark the panels, yet. BTW where do you got the MIDI sockets? are they snap-in? i like them. The MIDI sockets are in fact 5 pin DIN sockets and, yes, they are snap-in type. At the beginning I designed the board for PCB mount sockets, but I failed to find them locally. So I tried to find panel mount ones and I found those by chance in a store (in Bucharest...). I don't know any code or something. I'll try to find some reference on the net. i actually liked the black plastic look of the ones you found. fonik, guess what? I found them on eBay here and here. Maybe this will help. Posted: Tue May 31, 2011 2:20 am Post subject: QS300 with DB60XG? This is my first post. Please excuse me if this is a silly question, but I have been rather confused following some contradicting comments on the internet. Can someone please confirm that the NEC DB60XG does, in fact, contain the QS300 voices? There is an earlier comment that yes it does. However, without intending any disrespect to that poster, perhaps someone who has experience with both the Yamaha DB50XG and the NEC clone could clarify this? I have just purchased a NEC clone, with the intent of making a standalone unit, and then realised this dilemma. There is an actual DB50XG for sale here in NZ, which is relatively expensive, and I'm wondering whether I should purchase this too, since I see the QS300 ability as important. I also have one of those NEC clones and it does have QS300 voices capability. It does'n have them actually, they have to be "uploaded". I tested them with XGGold and all those voices are working great. For those interested, I also actually tested the A/D inputs with XGedit95 choosing SW60XG synth. All three effect processors are working great! The pitch change variation is quite impressive! vlad2011, thanks for the quick reply. Right, so XG Gold has the ability to "upload" this QS300 capability? I assume this is just some kind of message transmitted over midi, not involving any other kind of connection to the DB60XG? All you have to do is select "DB50XG or compatible" synth in settings, and select QS300 voices for parts. My version of stand alone GM Voice has a MIDI IN indicator LED. I noticed quite a lot of blinking while doing this. I did not studied the sysex involved, yet, but if you wish, you can do this with MIDI-OX. To start with, hello everybody - this is my first post. I've been following this project for quite a while now, but only recently have I decided to actually build it. I followed Thomas Henry's schematics and build the circuit on strip-board. However, I've got quite a problem. I connected the circuit to one of the NEC clone boards and was very impressed with the sound. This worked for about half a hour, but on resetting the unit, the board would no longer respond to anything. Assuming that the board was faulty, I ordered a second one only for the same thing to happen again. For the power supply, I'm using an external Molex power brick which supplies +12v and +5v. I'm using a ICL7662CPA to convert +12 to -12V. My multimeter reports voltages of +5.17v, +12.33v and -11.71v. If anybody has any ideas, they would be greatly appreciated because I really am at the end of my tether. Are these voltages with the NEC clone connected? The +/- 12V supply if I remember correctly supply the audio circuits on board and there are two onboard regulators so you can use +/-9V instead of 12V. These boards get quite hot and need good air circulation so did any of the onboard chips get hot? I have 3 clones and 2 originals and all have functioned perfectly on either DC to DC +/- 12V convertors or using a separate transformer for the 12V. Have you got a reset button or are you using a Capacitor? These voltages were taken with the board connected and powered up. The boards certainly did get hot. 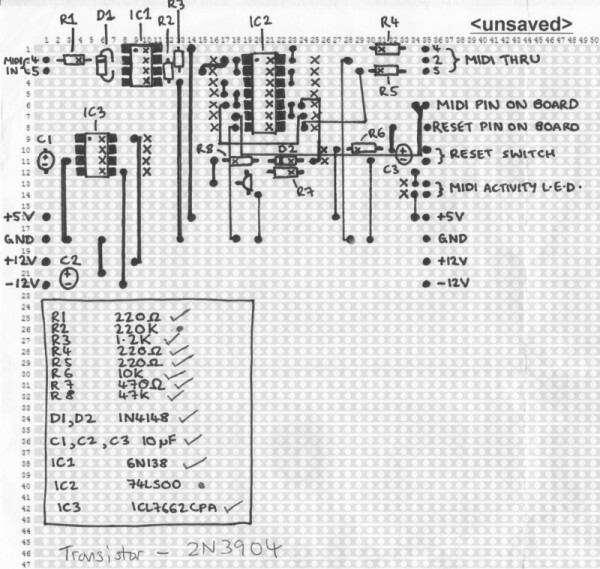 For the reset, I'm using the switch and capacitor as suggested in the original schematic. How are you controlling the board keyboard or computer? I remember I did have a problem once when an NEC would not start and I sent it a sysex XG reset message and it worked. With my PIC controller I always send this on startup. If you have XG Gold there is a button to do this as well or type it into MIDI-OX sysex panel. I've been trying with keyboard and computer, however I'll have a go with the XG Gold demo reset function. Alas, the XG reset did not work. This was the case for both boards. I did notice that most of the chips did get alarmingly hot, even though the board was running on my desk with no casing. I'm contemplating buying one last board, but I'm concerned that that will become fried as well. If the chips get alarmingly hot I am afraid that suggests a power problem to me. What are the off load voltages? It might be worth posting a photo of your board to see if anyone can see a fault. hope this helps. That looks OK. I would be tempted to use a different power supply if you are getting a new board. Or even try batteries monitor the tempreature +++. Might be worth checking the current the "dud" boards are taking if any. Thanks Thomas Henry and others for a great project. A friend got me a Yamaha D50XG board, so I had to start this one. It's more-less finished - I've etched boards from this thread, and we made a box; parts were at hand. Easy as it can be. +12 and +5v are just fine, but I got -18,2v where -12v should be - in all places - on psu board, on daughterboard connector and on pin 4 of output opamp. Regulator is just fine - it can't be that wrong and still working. I also tried swapping transformer windings, changing big capacitor, checking board for bridges several times - always the same. It seems to me like it's referenced to some wrong 0V. But i am measuring regarding to the analog ground, and both grounds are the same on the psu board.I tried both breaking and connecting two grounds on the daughterboard connector - no effect. I've tried unhooking both connector and the i/o board, but it's the same. Like it's wrong from the start. Please, if anyone has an idea tell me where to look. It starts getting on my nerves that I can't find where's the mistake. Please tell me your phone number, I must put it on the post office list. I know others here have ordered from him with good results. Did you get the same request, did you give your number, and did you get any spam calls that you think may have resulted from this? I am nervous about giving out that info to a total stranger. Thanks, and apologies again for being OT. this is pretty common practice on overseas shipments. if it's from Doublefish or Garfield, I can vouch for them. If you're still paranoid, try to use a work phone number instead of a home/cell number. I did not have to give my phone number that I can remember but the Chinese gov't is always coming up with new laws, so it's possible that's the issue. Thanks, I have never bought anything from China via eBay before, and had never come across this. I think I will give my work number as you suggest though. To anyone else still looking for one of these, doublefish still seems to have a steady supply, currently $20 with free shipping to USA.